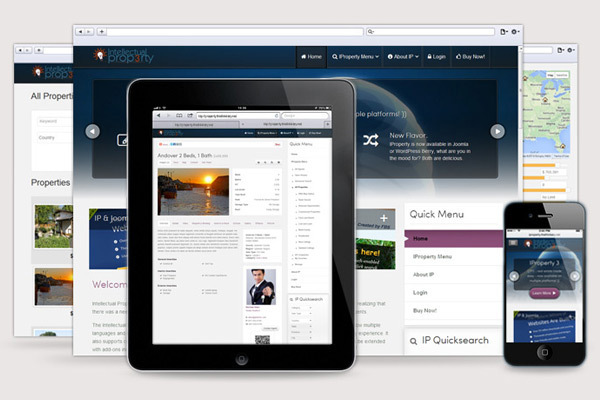 Intellectual Property, or "IProperty", is a top-selling Joomla real estate component created by the Thinkery LLC. by and for real estate agents. In cooperation with the best selling agents from one of the top-ranked brokerages in the United States (names withheld to protect the guilty! ), we worked to develop the broker's homepage, as well as agent sites that could share the data and "look and feel" of their parent site. View Demo Reviews Buy Now! Please note: many of these FAQs do not apply to the IProperty Flex product. There is no listing management or agent access levels, all you need to do is configure your settings and decide how to show your listings to potential clients! If you have questions, please don't hesitate to contact us. What versions of Joomla does IProperty support? IProperty is compatible with Joomla 1.5, 2.5, and 3.0+; however, Joomla 1.5 is no longer supported which means IProperty 1.5 development and support has ended. Does IProperty allow front-end editing? YES! IP2.5 and IP3 support front end editing. Site administrators are naturally wary of giving users access to the Joomla control panel. That's why IProperty provides a front-end management panel for agents and company administrators. From the front-end management panel, company admins can enable and disable listings, deactivate company agents, edit any listings, and more. Agents can add, edit and manage their listings, change listings' featured or published status, and edit meta tags and keywords. Using IProperty's access control list (ACL) functionality, you can allow agents to edit the listings of colleagues within the same company, or restrict them to their own listings. What is a super agent in IProperty? A super agent is an "agent admin." This user is allowed to manage all the agents and listings belonging to his company, but does not have any Joomla-specific admin capabilities. The super agent can also set all parameters for his company, including setting limits on max listings per agent, max featured listings, etc. By setting up super agents, the site admin can let other trusted users handle the day-to-day admin work without the possibility of an inexperienced user breaking the Joomla site. Are my IProperty listings Search Engine Friendly (SEF)? YES! All content in the IProperty system is easily index-able by search engines and web crawlers. We use syntactically correct HTML/XHTML and support custom meta tags and keywords on a per-listing basis. We also provide plugins for popular SEF Joomla extensions including AceSEF, sh404SEF, and Xmap. Is it possible to build a multi-lingual site with IProperty? YES! Using tools like JoomFish (available for Joomla 1.5 and 2.5 only at this time), Falang, and the new Joomla multi-language plugins and tools (Joomla 2.5+) you can create multi-lingual sites to support a variety of languages. Can I track hits and contacts? YES! You can use popular tracking tools like Google Analytics with IProperty, and The Thinkery developed add-on products such as the IReport package, which will provide your users with stylish, easy-to-use graphs and charts depicting many data points including hits by category, company, or agents. We also provide plugins that can send your form data to CRM systems like Salesforce.com and ZohoCRM. Can I import data into IProperty? YES! You can create a comma separated values (CSV) or extensible markup language (XML) file, and use IProperty's Bulk Import function to quickly import your existing listing data. If you don't want to handle the imports yourself, feel free to contact us for a quote on importing data. If you're an agent with access to FlexMLS, please see our IProperty Flex version here. Will my site still work after my subscription ends? YES! Your IProperty site will not be disabled after your subscription ends. However, in order to receive product updates and support, you will require a valid subscription. Does my subscription include IProperty modules and plugins? YES! All standard Modules and Plugins are included at no additional charge. We also include plugins to enable functionality with third party tools including sh404SEF, Xmap, and more. Please note that while we include our plugins for these extensions with your subscription, these third party extensions are NOT included with your subscription, and in some cases may require acquiring a subscription from their developer.